The mission of the Pierce County Noxious Weed Control Board is to preserve and protect our county’s native ecosystems, citizens, agricultural resources, recreational areas and other valuable resources from the economic losses and adverse effects that are associated with the presence and spread of noxious weeds. 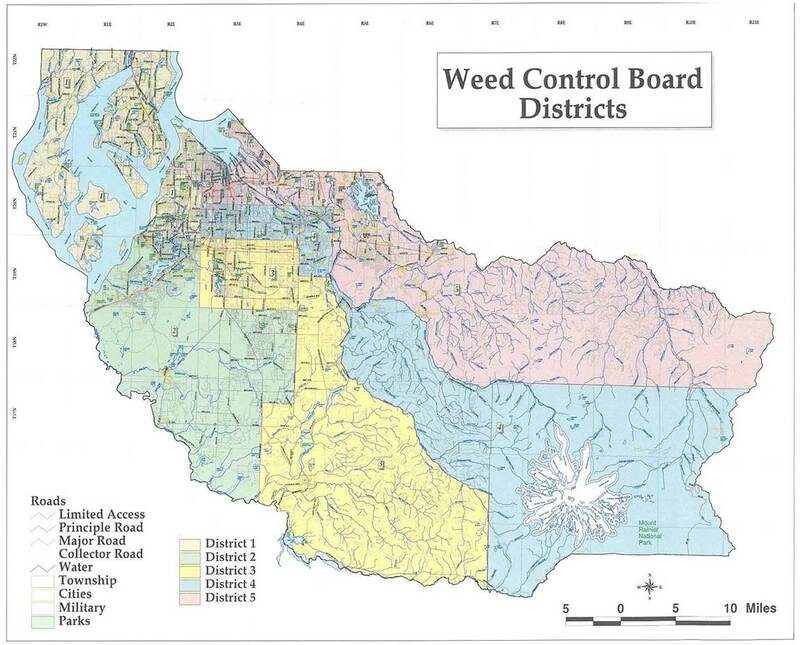 The Pierce County Noxious Weed Control Board is made up of appointed citizen volunteers, representing the people and interests of the county districts they come from, plus a non-voting advisory representative from the WSU extension in Pierce County. The Board in cooperation with the Program Director is responsible to establish and administer the policies and practices of the Noxious Weed Control Program in accordance with state regulations, adopt the annual Noxious Weed list and propose the annual operational budget. Weed Board meetings are held quarterly. Specific dates and times are published in the Tacoma News Tribune and meetings are open to the public. There is one voting board member appointed from each of the five county districts (see Board Member Districts map below), plus one non-voting member from the County Extension office. At least four of the voting members must be engaged in the primary production of agricultural products. Voting members of the board are appointed by the County Executive and confirmed by the Pierce County Council. Click here for a printable Board Member Application form. Please mail your completed application to our office. Click here to view our Board Member Districts map. DISTRICT NO. 1: Beginning: at the intersection of the East line of Range 2 East and the North boundary of Pierce County; thence, southerly along said easterly line to the 5th Standard Parallel; thence, westerly along said 5th Standard Parallel to the shoreline of Puget Sound; thence, southwesterly along said shoreline to its intersection with the boundary of Pierce County; thence, westerly and northerly along said boundary to the south line of Kitsap County; thence, easterly along said Kitsap Boundary to the intersection of the boundary between King and Pierce Counties; thence, generally southerly and easterly along said boundary to the point of beginning. DISTRICT NO. 2: Beginning: at the intersection of the southern boundary of pierce County and the east line of Range 3 East; thence, westerly along said boundary of Pierce County to the shoreline of Puget Sound; thence, northeasterly along said shoreline to the north line of Township 19 North; thence, easterly along said north line to the east line of Range 2 East; thence, southerly along said east line to the north line of Township 18 North; thence, easterly along said Township line to the center line of Range 4 East; thence, southerly along said centerline to the north line of Section 16 of Township 17 North thence, westerly along said north line to the east line of Range 3 East; thence, southerly along said Range line to the point of beginning. DISTRICT NO. 3: Beginning: at the intersection of the west boundary of Mt. Rainier National Park and the southern boundary of Pierce County; thence, westerly along the southern boundary of Pierce County to the east line of Range 3 East; thence, northerly along said Range line to the north line of Section 18 of Township 17 North; thence, easterly along said north lines of Sections 16, 17, and 18 to the centerline of Range 4 East, Township 17 North; thence, northerly along said centerline to the north line of Township 18 North; thence, westerly along said line to the east line of Range 2 East; thence, northerly along said line to the north line of Township 19 North; thence, east on said township line to the centerline of Range 4 East; thence, southerly along said centerline to the centerline of Township 19 North; thence, easterly on said township line to the east line of Range 4 East; thence, southerly on said range line to its intersection with the Puyallup River; thence, southerly and easterly along said Puyallup River and the North Fork of the Puyallup River to the west boundary of Rainier National Park; thence, southerly along said westerly line to the point of beginning. DISTRICT NO. 4: Beginning: at the intersection of the north line of Township 17 North and the eastern boundary of Pierce County; thence, westerly along said north line to its intersection with the Carbon River; thence, northerly and westerly along Carbon River to its intersection with the east line of Range 4 East; thence, northerly along said range line to the center of Township 20 North; thence, westerly along said centerline to the east line of Range 2 East; thence, north along said range line to its intersection with the 5th Standard Parallel; thence, west along said 5th Standard Parallel to Puget Sound; thence, southwesterly along Puget Sound to the south line of Township 20 North; thence, easterly along said line to the centerline of Range 4 East; thence, southerly along said centerline to the centerline of Township 19 North; thence, easterly along said township line tot he east line of Range 4 East; thence, southerly along said range line to its intersection with the Puyallup River; thence, southerly and easterly along the Puyallup River to the west boundary of Rainier National Park; thence, southerly along the west boundary of the Rainier National Park to the southern boundary of Pierce County; thence, easterly along said southern boundary of Pierce County to the boundary of Pierce and Yakima Counties; thence, northerly along the eastern boundary of Pierce County to the point of beginning. DISTRICT NO 5: Beginning: at the intersection of the north line of Township 17 North and the eastern boundary of Pierce County; thence, westerly along said north line to its intersection with the Carbon River; thence, northerly and westerly along the Carbon River to its intersection with the east line of Range 4 East; thence, northerly along said range line to the center of Township 20 North; thence, westerly along said centerline to the east line of Range 2 East; thence, north along said range line to the boundary line of Pierce County; thence, easterly along said County boundary line to its intersection with Yakima County; thence, southerly along said boundary line to Point of Beginning.